Wow, Bloggers United SEVEN. Who would’ve thought we’d come this far? Props to the BU team for making all of this possible and for making BU bigger and better each time. 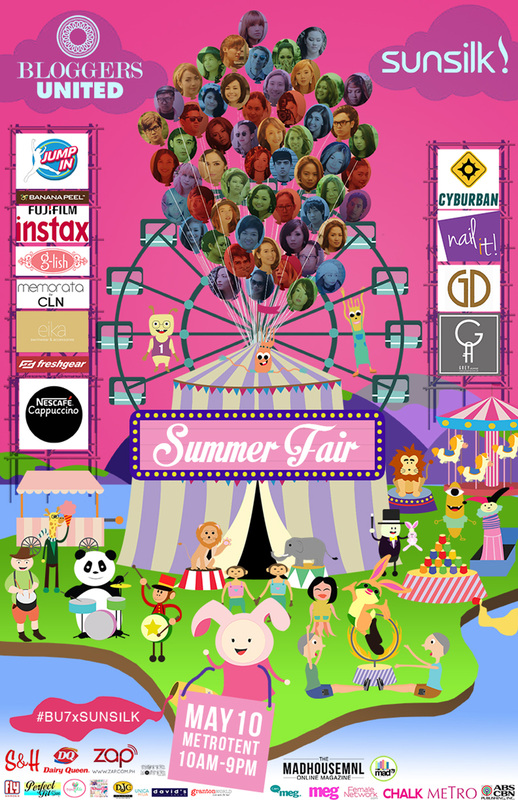 This summer, in order to give you the grandest BU yet, Bloggers United teamed up with Sunsilk for a summer fair you wouldn’t want to miss. In usual Bloggers United fashion, you’ll still get to meet your favorite beauty and style bloggers and shop their pre-loved and brand new items. But aside from these, you’ll also get to enjoy game booths, challenges, a pop-up salon, playground, food trucks and other fun surprises! So you better make sure to drop by Bloggers United 7 this May 10 from 10 AM to 9 PM at Metrotent, Ortigas. Tickets will be sold at the venue for PhP 100 or you can get in for free by bringing a 180mL Sunsilk Pink bottle. I’m selling A LOT of shoes this time around so shoe lovers, rejoice! For your reference, my shoe size is US7 and my sister’s is US5. f you’ve been to BU before, you must already know that the early bird catches the worm so if you want to get the best items, come early! Enjoy BU7! Tweet me so that I can somehow feel that I’m there with you guys. Official hashtags for BU7 is #BU7xSUNSILK and #SummerFair. For more information and updates about Bloggers United 7, follow BU on Facebook, Twitter and Instagram. Camille!!! How’s Barcelona? Uwi kana! hahaha! I’m happy and a bit disapointed during BU7. Happy because I was able to hoard your stuff, clothes, shoes and accessories, but not your lace dress that everyone is aiming that day. I am the earliest during that time as in pumila ako sa door agad. When I got to your booth the first thing I look for was your lace dress and it wasn’t there. I asked Ate Cla about it and she said it was a blogger who got it. I felt na nadaya kasi isn’t it supposed to be sell to the readers? and to think na nasa loob na sila and kami tinitiis ang init ng araw and nakapila tapos sila nauuna na pala? I know I sound over dramatic pero it’s so unfair? kaya nga ako pumunta ng maaga para mauna tapos ung iba pala tao sa loob ng BU namimili na? :( I really like kc the dress kaya I have to make sumbong hahaha! pwede ba exclusive for your readers ung mga stuff mo next BU? hahaha! Selfish but it’s a serious question? :))) By the way, thank you for selling your beautiful stuff. Sa lahat ng BU ngaun lang ako kinilig sa mga nabili ko sa booth mo sobra magaganda talaga! kaya 10 gamit mo binili ko hahaha! How i wish. How i wishhhhhh na taga luzon/visayas ako so that Makapunta ako ng mga ganyan :(:(:(:(:( In college i sweaaar if I have the mawneh hihi xD one dayyyy. One dayyyy. Shoes!! And the dress! I love the first and the six dress..Congratulations to Bloggers United. haha! :) Thank you dear sister of mine! Oh my goodness! first photo! If only I could fly to Manila again. Oh well maybe during the next BU then but it’s okay at least I got to meet you during your b-day dinner. *grins so wide* You are indeed selling the lace dress Cams! I’ve been eyeing that one… It’s so so pretty. Anyway, do enjoy Barcelona for us. Take loads of photos. I’ve enjoyed the last Pronovias post so much. I can’t wait what they’ll have in store next! Have fun! I wish you live closer! :) Thank you Anne! :) Can’t wait to blog about my trip! The “to die for” shoes! hahahaha… love it. sad to know you can’t be there…since we have an event that day too, it’s also impossible for me to be there :( . But its less painful coz you’ll never be there din naman.. LOL..but i’ll still drop by some other time.. :) Hope I can take home some of the items from your booth and hindi maubusan.. excited for the Pronovias’ post! God Bless..
Hello ate Cams! Wow. Hala, I badly want most of your items ate Cams. Sadly, mukhang ‘di kami tuloy this Sat. Huhu. Maybe BU8? Hehe, sana. At I hope you and your girl group will be there too! Girl group talaga? :) Thanks Mai! See you BU8 din! Thanks Arianna! I hope you guys had a blast! omg you’re already selling that silver and black dress. I want that one, haha! Thanks Elle! Hope you got some stuff from my booth! These pictures are great!Good luck with the event! Yes she does! :) Thanks Ralen!